The roof can be opened. No wheels included. 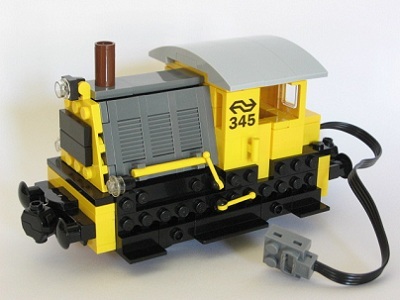 You need a PF train motor or dummy motor to build it. For a running PF train you need to place the PF Battery Box (88000 or 8878) and the PF IR Receiver (8884) in a carriage. The Dutch Railways (Nederlandse Spoorwegen or NS in short) Class 200 diesel locomotives were built for shunting duties and for the transport of small light freight trains. The Class 200 should collect freight wagons on smaller stations and bring them to middle seized stations where the could be incorporated in normal freight trains. The engine was designed by locomotive designer Labrijn. The first series of 12 engines was built in 1934. In total 169 of these small locomotives, numbered 201-369, were built by Werkspoor and the Central Workshop of the Dutch Railways from 1934-1951. They were known as "Sikken" (Sik in singular, goats) by rail enthusiasts. They served for about 70 years successfully until 2001. Unfortunately after an accident the Labour Inspectorate prohibited to work with these engines and most of them were taken out of service. Many are preserved and can be found at railway museums or are privately owned. The 3 printed bricks are included with the instructions. On the CD also the building instruction of the 9V version.